Home / ADAPTATION / Finding One's Soulmate in "Every Day"
Finding One's Soulmate in "Every Day"
Exploring the universal themes of true love, identity and coming of age, the upcoming charming movie “Every Day” reflects very contemporary ideas about acceptance and the freedom to be whoever you are – an idea very resonant in today’s young people who increasingly reject categorization. The movie follows a teenage entity named only A, who wakes up every day in a different body, Every Day deals with the challenges faced when A falls head over heels in love with Rhiannon (Angourie Rice), a girl unlike anyone they’ve ever met. Can you have a relationship with a soul who inhabits a different body every day – sometimes boy, sometimes girl, sometimes the school quarterback, sometimes the outcast? Who are you removed of your body, your race, your clothes, your family? The story is the actualization of the old adage that we should ‘love someone for who they are on the inside,’ all the more powerful because it is set during the teenage years when we customarily try on and experiment with myriad external identities in an effort to figure out we are. The Rhiannon who we meet at the beginning of the film is living a fairly conventional life, albeit being the rock of her destabilized family. A nice girl, a good friend, a solid student, Rhiannon is dating the popular boy at school, though she doesn’t feel very connected to him or much appreciated. She’s playing all the parts she feels she should play at the expense of her own self-discovery. 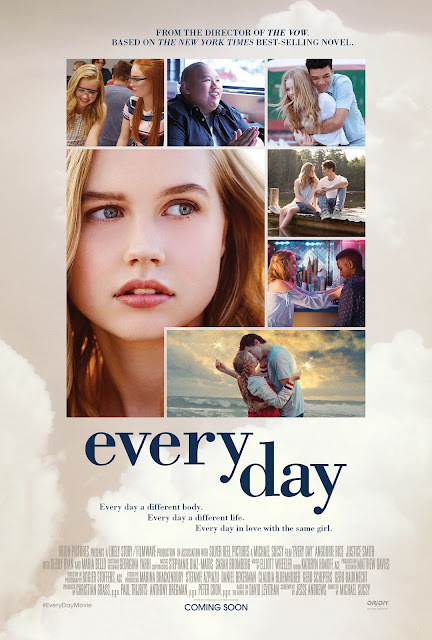 “Every Day” opens February 21 in cinemas nationwide from Pioneer Films.